6-pin Pmod connector with UART interface. Pmod GPS can provide satellite positioning accuracy to any embedded system. 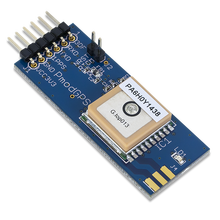 By communicating through UART with the GlobalTop FGPMMOPA6H GPS module, users may benefit from the 3 meter accuracy for any long term traveling. Custom antistatic Pmod packaging is included. Related links to "Pmod GPS"